Loving someone who has treated you unjustly can be a difficult thing to do. And sometimes people will repay unkind behavior with more unkind behavior. And there are probably all sorts of reasons for that such as hurt feelings or defensiveness. But this is not the case with young Sophia in the story, Sophia’s Yellow Scarf. In fact she does the opposite and is kind and thoughtful to someone who didn’t deserve it. It is interesting to note what kind of a person Sophia is as the story unfolds. The tale portrays her as a joyful and enthusiastic person who loves to share her talents and gifts with other people. So I believe that because Sophia practices doing good things, she finds it easier to do good to another young girl who wrongs her. In the end the reward for both of the girls is enormous. 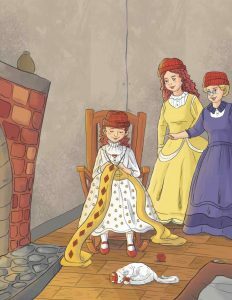 As one would expect, the idea for this story came as a result of the first book, Sophia’s Red Hat. It wouldn’t just do to have a hat: one must have a scarf to match the hat and so emerged the idea. And since this series of books is based on a math concept, putting diamonds in the scarf seemed like the perfect way to present another math problem. Again the math question posed at the end of the story can be altered for completing very simple addition problems or can be used for a much more complicated concept suited for middle school students. But in addition to this, the story focuses on diamond shapes which can be found in various amounts on the scarf throughout the story and in the illustrations themselves; also great for an art lesson.